The encyclopedia brings the work of the best classical scholars, archaeologists, and historians together in an easy-to-use format. With over 1000 articles written by leading scholars in the field, it seeks to convey the significance of the people, places, and historical events of classical antiquity, together with its intellectual and material culture. Broad overviews of literature, history, archaeology, art, philosophy, science, and religion are complimented by articles on authors and their works, literary genres and periods, historical figures and events, archaeologists and archaeological sites, artists and artistic themes and materials, philosophers and philosophical schools, scientists and scientific areas, gods, heroes, and myths. 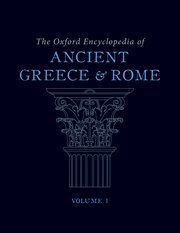 Oxford Encyclopedia of Ancient Greece and Rome also includes maps, genealogical tables, chronologies, topical outlines, indexes, and a wealth of illustrations. And each article has a bibliography to allow you to further your research. The Library already has the Oxford Encyclopedia of Ancient Greece and Rome in hard copy, look under “Find it in Library” in DiscoverEd. The hard copy is reference only so is not available to borrow and can only be consulted within the Main Library. Access to online resources are only available to current students and staff at University of Edinburgh. This entry was posted in Books, Library, New, Online resource and tagged Ancient history, Archaeology, Classics, E-books, Greece, Hellenistic period, History, Rome by cstirling. Bookmark the permalink.